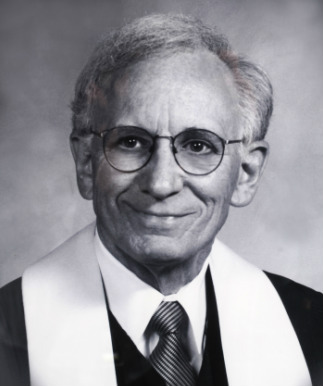 Dr. Gaylord L. Lehman, age 81, died Friday, November 15, 2013, at Duke University Medical Center, after a brief illness. Born September 19, 1932, in Louisville, KY, he was the son of the late J. Edward Lehman and Orpha Gerig Lehman. He grew up in Inman, South Carolina, and was educated at Gardner-Webb College and Furman University, where he received his BA degree in 1954. He graduated from the Southern Baptist Theological Seminary in Louisville, KY in 1957, and received the Doctor of Theology degree in homiletics (preaching) from that institution in 1961. He served as Instructor of Preaching at Southern Seminary from 1960-61. Dr. Lehman served as pastor of the Benson Baptist Church in Benson, NC, from 1962-1966. In 1966, he became pastor of Lakeside Baptist Church in Rocky Mount and served there for thirty-two years until his retirement in 1998. After retirement, he became active in area churches, preaching at Bethany Presbyterian Church in Wilson, First Presbyterian Church in Wilson, Howard Memorial Presbyterian Church in Tarboro, and Pinetops Presbyterian Church in Pinetops. Dr. Lehman was involved in a number of community activities, serving as chairman of the Rocky Mount Human Relations Commission, chairman of the Rocky Mount Nash unit of the American Cancer Society, chairman of the board of Meals on Wheels, and president of the Rocky Mount Kiwanis Club. For seven years, he served as a member of the Rocky Mount City Board of Education. He was also instrumental in the foundation of the Rocky Mount Area Habitat for Humanity and served as a trustee of Meredith College. Dr. Lehman is survived by his wife of 59 years, Faith Johnson Lehman; brothers, Dr. Lamar Lehman (Brian) of Greenville, SC, and Dr. Jerry D. Lehman (Faye), of Inman, SC; children, Carol Lucas (Will) of Rocky Mount, John Lehman (Nancy) of Durham, and Kaye Emack (Jim) of Birmingham, AL; grandchildren, John Lucas, Jeff Lucas, Henry Emack, Carter Emack, Grey Lehman, and Lily Lehman; nieces and nephews, Keith Lehman (Kellee) of Fayetteville, GA, Nancy L. Robson (Johnny) of Black Mountain, NC; Rusty Rohrbaugh (Joy) of Greenville, SC; Lynn Lehman of Spartanburg, SC, and Leigh Ann Lehman of Gainesville, FL. A memorial service was held at Lakeside Baptist Church on Tuesday, November 19, at 11:00 a.m. The family suggests that any memorials be made to Lakeside Baptist Church (1501 Sunset Avenue, Rocky Mount, NC 27804), or Meals on Wheels of Rocky Mount (1501 Sunset Avenue, Rocky Mount, NC 27804). To listen to the memorial service, click here. This past week I found myself in Dad's office across from City Lake, his "Man Cave" that he shared with Tracie and Wicky and Ziggy. As I sat as his desk, looking for legal documents, it struck me that the room was a microcosm of his life, the Essential Gaylord Lehman, if you will. On top of the desk, fresh out of the printer, was a Carolina basketball schedule, waiting to be analyzed and dissected with the Lucas boys. Underneath was a pile of notes and open books, the beginnings of the next Sunday's sermon. On the bookshelf was a plastic figure from the 1960's of Charlie Brown, who provided many a sermon illustration, and a stadium cup from the Chapel Hill watering hole, He's Not Here. Dad LOVED the name of that bar, and it worked its way into many sermons over the years! "LIFE IS SHORT . . . STAY AWAKE FOR IT!" And Dad was awake, for 81 full and vibrant years. He was awake to new ideas and to the possibilities of each new day. He was awake to the needs of those of us who sat in the pews where he ministered. He was awake to the injustices and inequities of our community and worked tirelessly through the years to improve the situation through his work with the Rocky Mount City School Board, the Human Relations Commission, American Cancer Society, Nash County Social Services, and, closest to his heart, Meals on Wheels. And he was constantly awake to those comings and goings of daily life, both large and small, that could find their way into his sermons, right up until the minute he reached the pulpit on Sunday! He enjoyed driving Honda Accords, and he was on #13! He loved nice ties, and each of the men in our family is sporting neckwear from the Gaylord Lehman Collection today! He loved the Outer Banks, and walking around New York City. He loved MAPS, the old fashioned kind that fold out and refuse to fold back up, and he would draw elaborate directions for us before the invention of GPS took all the fun out of it! He loved the Carolina Tarheels and Tarheel basketball in particular. And he loved us, his family, and was so proud of us, especially his six grandchildren, each with their own unique gifts and abilities. But then there is the Essential Gaylord Lehman that you do know about. You know that Dad was an artist with words, the consummate wordsmith. Whether it was a sermon or wedding homily, a funeral eulogy or a Chamber presentation, whatever Dad said, he said it right! He came to the lectern with the ink still wet on the page, crafting and revising his words until the very last second to make them relevant. He knew how to make his Sunday words work for a Monday world. You know that Dad loved to design a worship service. He knew just what to put in and what to leave out, and he firmly believed in being out in an hour because he said after that no one is listening to you! As he advised the assistant ministers he trained, "Talk about God, and talk about twenty minutes!" He loved good church music and hymns, especially the bright and joyful kind we have heard here today. As Mark Gansor told me earlier this week, "Gaylord and Barbara Biggs are planning Advent in Heaven this year!" We are each sad in our own way that, to paraphrase the name of the bar, Dad's Not Here. We will miss his smile, his laugh, his positive words, his Gaylord-isms! But he really IS here! He is present in the hearts and lives of those who knew him and were touched by him, in his legacy of Lakeside Church, and in this community which he loved and strived for decades to make a better place. In a minute we will conclude this service in the most joyous possible way, with a Dixieland style horn and a hymn that will leave you smiling and uplifted. Dad considered it the best possible way to honor a life! Because he was not about staying and mourning, he was about marching forth and doing! He was about being AWAKE! AND AS YOU GO, REMEMBER . . .
AND BROUGHT EVEN TO THIS HOUR.